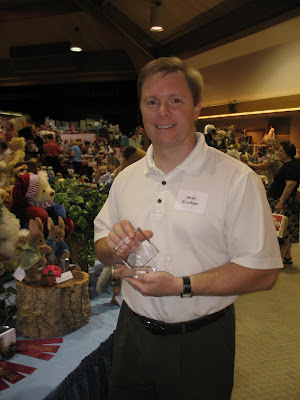 I'm back from the Sauder Village Doll and Teddy Bear Show! It was a delightful show. 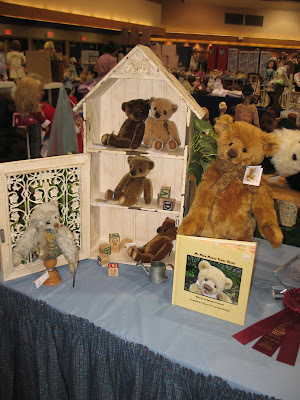 Most of the exhibitors were doll and/or Teddy Bear dealers, but there were a couple of original doll artists present and seven Teddy Bear artists. 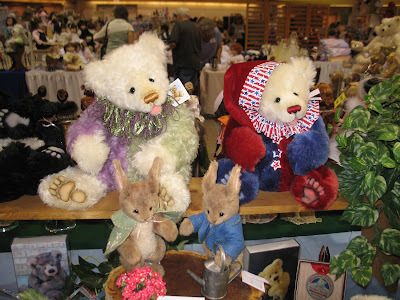 The collectors were wonderful, as usual, and five of my pieces (two bunnies and three bears) found new homes. 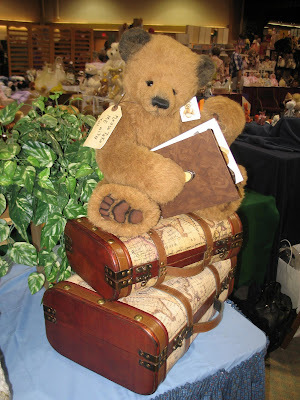 Another bear found his new home as soon as I got back from the show. It was also delightful to meet (in person--I know Bobbie from Teddy Talk) artists Bobbie Ripperger, Berta Hesen-Mensen, and to see Jacquie Pollitt and Marilyn Wagner again. We also enjoyed seeing Beth and Ben Savino of the Toy Store again. As usual, I was so busy chatting with table visitors to think much of my camera, but I did remember to get a couple of shots of my table, and my handsome assistant. This is most of my table. I couldn't stand back far enough to get it all in at once. The Traveling Bear got cut off, but here he is. Here is a closer look at Jax, Doodle, Flopsy, and Peter. A closer look at my more traditional Teddy Bears...The Little Floppies, Pincushion, and Simon. And last, but certainly not least, my handsome assistant Sean(AKA husband, best friend, soulmate, etc.) He was a great help, and of course I love his company. He is not able to come along often so it was a real treat.A treat for me, I mean! As is always the case with traveling to shows, I was ready to be home at the end. But shows always leave me looking forward to the next one too! I'll let you know when that will be. For now I need to change gears a bit, and get ready to start teaching school again. 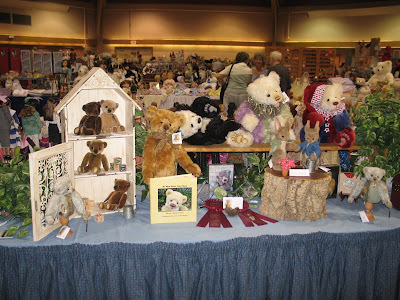 Debra I'd love to see you at a show and see your lovely bears in person as well! I don't do too many though...two per year is about it, although this year it will be four thanks to the online shows! I've never done a show out west.